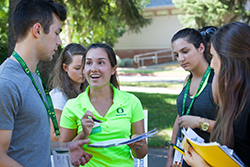 The Ambassador Program is the University of Oregon's primary student recruitment team. The program’s staff of current students recruits prospective students through campus tours, open house events, and off-campus receptions. 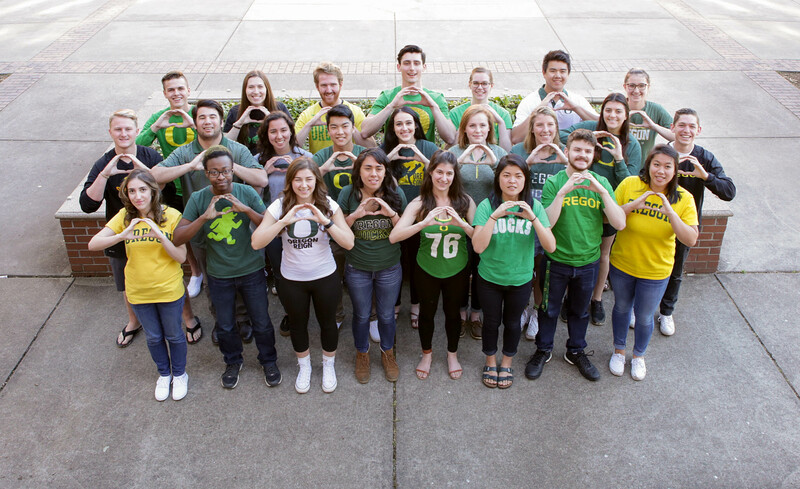 Often serving as the first contact prospective students have with the UO, Ambassadors act as the UO’s public face, representing what it means to be a Duck to a large and varied audience. The Ambassador Program application is open now for 2019–20. The deadline to apply for this hiring cycle is Wednesday, May 1, at 7:59 a.m. Ambassadors will give campus tours to visitors and act as a student representative at off-site recruitment events when needed. Duties also include working Duck Preview, Duck Days, and Just for Juniors events, serving on student panels, referring questions to appropriate departments, and other duties as assigned. 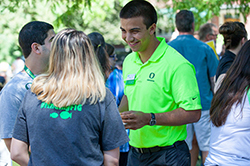 While maintaining the same workload as all ambassadors, multicultural recruiters specifically focus their recruitment efforts on underrepresented students, especially through Connections open house events. These students have an in-depth knowledge of multicultural recruitment issues and a broad base of involvement with campus services and resources related to cultural diversity. The Welcome Team is responsible for planning and coordinating new students' transition through large and small welcome events. 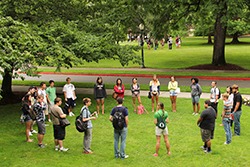 The Welcome Team is directly involved in Week of Welcome, Winter Warmup, and programming during the first six weeks of fall term. The hiring process for the 2019 Welcome Team has concluded. However, the application remains open until the next hiring period. Feel free to fill out an application anytime, but note the next hiring period will not occur until fall 2019. 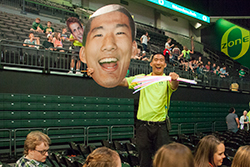 Student Orientation Staff (SOS) members are an elite staff of current undergraduate students who represent the University of Oregon. 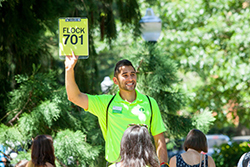 They are the first to engage all new students as they enroll at the UO, and it is their job to guide these students through a smooth transition to life on campus. They are directly involved in IntroDUCKtion and Week of Welcome. Learn more about being an SOSer. The hiring process for the 2019 Student Orientation Staff has concluded. However, the application remains open until the next hiring period. Feel free to fill out an application anytime, but note the next hiring period will not occur until fall 2019.